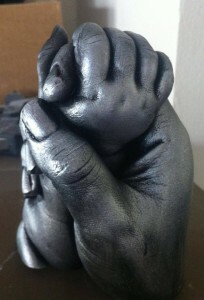 Jodi Humphreys is a keepsake artist who runs Freddie’s Footprint, a small business which specialises in creating highly detailed casts of a baby’s hand or foot, as an original and bespoke gift. Jodi describes her process and how she came to start her business. 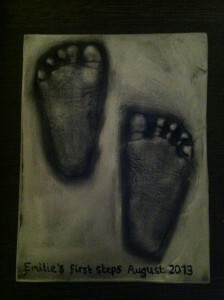 My name is Jodi and I am a keepsake artist specialising in making casts of baby’s and children's hands, feet and fingerprints. I transform these casts into keepsakes and jewellery. As a parent myself, I know how quickly babies grow and how important it is to capture those precious early years before they are gone. It's been almost 2 years now since I learnt how to create both the 3D and 2D casts. 3D Casts are taken by submerging the baby's hand or foot into a substance called alginate (which is also commonly used in dental surgeries to take moulds of teeth). 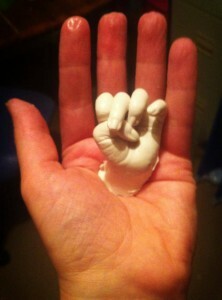 It takes 1-2 minutes to set, and is then cast using a high quality plaster creating a life sized statuette of the baby's hand or foot capturing every tiny little detail. The plaster needs to be left to dry out for around 2 weeks, and then the casts are handpainted with a pewter finish in either silver, bronze or gold. 2D Casts (Outprints) are taken by lightly pressing the baby's hand or foot into ceramic clay and are again cast using high quality plaster creating a raised impression of the hand or foot, against a plaque background. These also need to be left to dry for around 2 weeks and are handpainted in a pewter finish in silver, bronze or gold. A lot of my business comes from word of mouth so people often come to me asking for what their friend had done. When my son Freddie was around 5 months old, I knew that when my maternity leave ended I didn't want to return to my old office job, as I wanted to spend as much time as possible with him while he was growing up. At the same time I was also looking for something like the outprints to be done of his feet and had trouble locating someone locally. I've always been creative and a bit of an "I can do that myself" kinda girl so I found an online course which showed me how. I made my first outprint and over the months also learnt how to create the 3d casts and more recently hand/foot and fingerprint jewellery. At the moment I have one dedicated work day a week which varies greatly depending on what I'm working on or how many appointments I've got on that day. I also work a lot at the weekends when my husband is home and in the evenings when Freddie is asleep. I guess I don't really have a typical work day which is probably why I love doing this so much. You can see more of Jodi’s work on her Facebook Page, which she regularly updates with projects she’s working on. She can be contacted by phone on 07797799171 or email freddiesfootprint@hotmail.com to answer any questions or to arrange an appointment.